Theresa May will deliver a major speech within the next three weeks outlining the future relationship Britain wants to have with the EU. We’re already halfway there and Oor Theresa is just now only three weeks away from delivering her Brexit Vision. This cabinet of goobers is so stupid and incompetent I wouldn’t trust them to run a piss-up in a brewery. 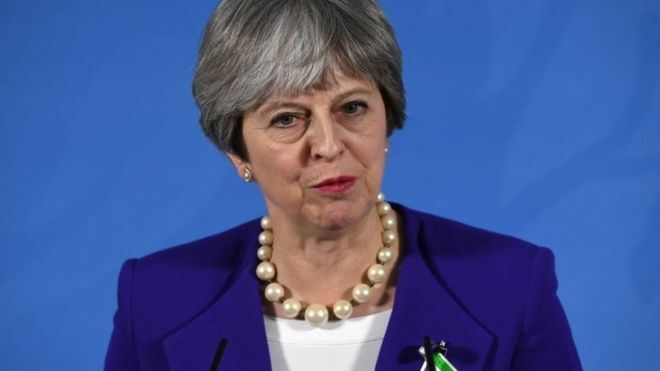 And can someone tell her her clunky faux pearls do not add to any appeal she might at some distant time in the past have had. Next Next post: Ah, there are sensible Tory MPs. Who would have thunk it?